I knew there would be lots of pie in the Ohio Amish country, where DH and I vacationed last week, but I didn't expect the opportunity to bid on homemade pies (and cakes, noodles, breads, pickles, honey, jam and more) at a real-life auction, one of several held weekly in the small towns that dot the countryside. 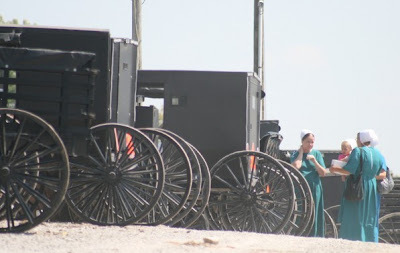 I love the idea of all these Amish and Mennonite women putting up pickles and jam, baking cakes and breads and then bringing them, usually via horse and buggy, to produce auctions, like this one (pictured top) in Mt. Hope, Ohio. DH took this picture of women bringing their goods to auction. 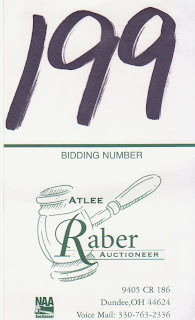 Later that day, we went to a more general auction, and while waiting to get a number (pictured above), I saw a few Amish women entering zucchini bread and pies into the auction. 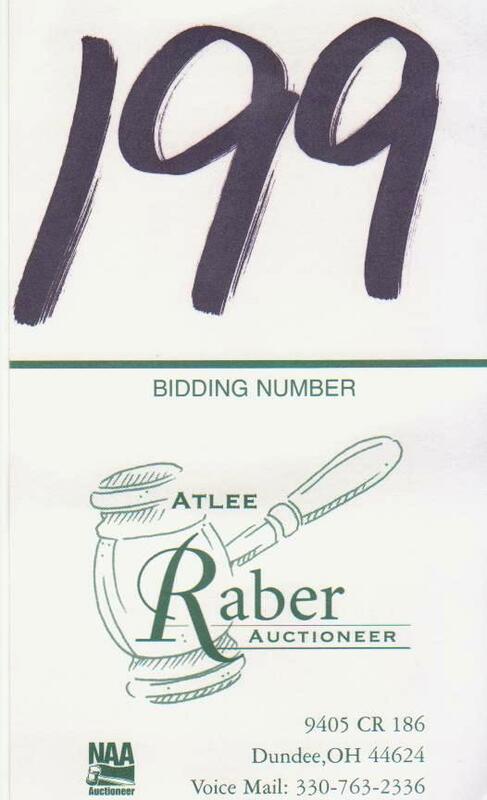 We waited a while to bid on some baked goods, but the auctioneer (watch the 12-second clip!) had a lot of carnival glass and antiques to go through before he moved on to the food. A return trip is in order. My friend lives in Amish Country in Wisconsin, and when I visit her, every day I wake up to the clop clop of buggies outside. Love their farm stands too! I'm not sure if you know, but they do not like having their pictures taken (of their face). They believe it is a graven image. That is why even Amish dolls do not have faces...just a thought.